Well, I feel that I am motivated lately, just now exactly. Is teaching my real world? That was the question about my boredom of having such continuity teaching. I don’t know how many times I have thought about this kind of things even before I went on my very nice vacation. Yeah, moreover after having vacation, I set myself to be much bored ever than before. Then suddenly *is it suddenly? *, I think that teaching IS NOT the world that I am gonna exist on. I am not the type of one who likes to bring the rest of job home. I am sure, none of us wanna have it. No one is willing to bring their job that should have finished at office to home. No one wanna be too busy till having no time for taking a sweet rest. Then tonight, after teaching one of my career-woman-students, I am motivated *yes, I AM STILL motivated! * to quit teaching. But maybe not very soon I will do that. 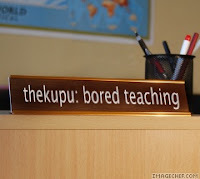 I still need to teach, even maybe now I am in the peak of boredom. I have thought about out from teaching world, but have not considered it yet. So, maybe it’s not the final decision for now *since I still need to teach for some unspoken reasons*. But however, now what’s in my mind is finishing my study soon. After graduating, I have to make an application letter *a serious application letter for finding fun job that I don’t have to bring home*, and keep thinking that teaching will be bored activity to do, too complicated for me today. I also have talked about it to my mom, and she thinks than I am too much in teaching. She thinks that teaching in 3 different places at the same time makes me have that boredom in my mind. Yeah, I just don’t know how to tell about what I felt now. Anyway, my mother also admitted that she herself sometimes has that way as me! That’s why, I think it’s just fair for me to have different kinds of job as now. Teaching is enough. Teaching is not my REAL future. Then, what about ambition being a lecturer? 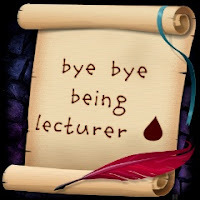 How will I be a lecturer while I do not want to deal with teaching *in the formal classroom regularly*? Yeah, absolutely I am gonna save my dream since tonight and forever. The thing that I am thinking about is ME sitting down behind the back, in front of the computer completed with internet connection, finding some information for the office, making some drafts, finishing some deadline *I hate deadline, tough*. I am thinking me in white collar, match to my jilbab, long appropriate trousers. I am thinking of a career woman who is having breakfast at 8 A.M, driving to work, and then going home at 4 P.M happily. No more jobs to bring home. Is there any? Well, broadcasting is one of the jobs. Although sometimes I still need to prepare something for giving to listeners at home, but I NEVER feel REALLY BURDEN about my job as broadcaster. I am happy much to be broadcaster. Hoooosh my goodness, what’s going on to me? I am dizzy now. Problem about feeling appears just now. I can’t think and go on writing more. Good night.